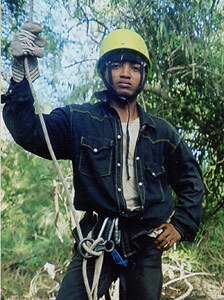 Tolojanahary started with The Peregrine Fund’s Madagascar Project in 2002 as a DEA (Masters equivalent degree) student studying the nesting ecology of the Yellow-billed Kite. He obtained his DEA degree in 2005 from the University of Antananarivo. Since 2004, he has assisted other Malagasy students in their studies, for example on the Madagascar Cuckoo Hawk and Black Kite in Ambatovaky and Berenty Special Reserves, respectively. He also participated in updating The Peregrine Fund's Madagascar Project database and office library. Beginning in 2007, and after the rediscovery of the Madagascar Pochard, he began assisting in biological studies and surveys of this critically endangered species with other project staff members. In 2010, he became assistant biologist for Gilbert Razafimanjato for developing and managing the Tambohorano wetland protected site. He has a strong interest and fascination in ornithology, and is interested in beginning new biological studies on Malagasy birds.